This cute Math Start book is perfect for teaching tallying! And... Jabar's illustrations are adorable! As with all MathStart books, pages at the end include ideas for extension activities --helping you turn a read aloud of this book into a whole graphing lesson. 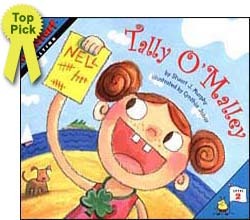 Your students will likely want to try their hand at tallying after a read aloud of this book. Below are sample spreads from inside this book--showing the very cute illustration style, the general amount of text per page, and the beginning of the graphing focus in the book. Reread the story and have your students keep track of the data with their own tally marks. Make a chart with each of the characters' names, the colors they choose, and their tallies. Occasionally, stop to see how the child's tally marks compare with the marks in the book. Say a number btwn 10-25 and ask students to make tally marks to represent that number. Pizza Survey: Have the child or students take a survey, asking ask family, friends, and neighbors, "What kind of pizza do you like best?" Then work together to tally the responses. What kind of pizza is most popular? Least popular? Plus there's a PDF activity page. Access the site here. 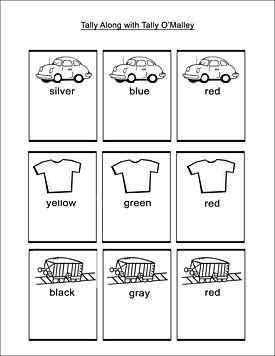 Pass out our worksheet for this book to each students and have them color in the pictures the appropriate color (listed below the picture). Then read this book to your student and have them tally along as you read. At the end of each tallying game, stop and have your students check to see if their tally marks match the tally marks in the book.